While the development of naval aviation can only be seen as an inevitable milestone in the evolution of manned military flights, the debut flight of the United States Navy’s first aviator, Lieutenant Theodore Ellyson, was as much a “happy accident” as it was the result of intentional planning. It is true that Ellyson had been sent by the Navy to North Island (later designated Naval Air Station San Diego and then Naval Air Station North Island) for aviation training under the legendary pilot and aircraft designer Glenn Curtiss. But Ellyson’s first flight was in a “grass cutter”—an aircraft intentionally designed not to leave the ground, but rather to allow the pilot to become acquainted with the controls and instrumentation while taxiing. Ellyson somehow coaxed the plane off the ground in spite of a throttle governor that had been put on the engine to prevent it from generating enough RPMs to create lift, but quickly came back to earth and executed what is charitably described as a “wing-first” landing. 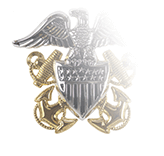 It wasn’t until 1917 that the Navy introduced the Naval Aviator breast insignia, featuring the now-iconic pair of wings (a design used for all military and civilian aviator) with superimposed shield of thirteen stripes and a fouled anchor. Although the overwhelming majority of today’s Naval Aviators are officers, this has not always been the case. In 1916, the Navy established the Enlisted Flight Training Program, and in 1920 the first Naval Aviation Pilot (NAP) certificate was issued. A year later, the NAP designation was expanded to denote the type of aircraft these enlisted aviators flew: seaplane, ship-plane, and airship. 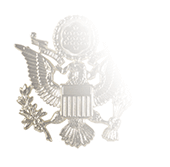 In addition to wearing the Naval Aviator breast insignia, these enlisted Seamen still wore their rating badges. A Chief Aviation Pilot rating was established in 1924, followed three years by an Aviation Pilot First Class rate. The Enlisted Flight Training Program came to end after the end of World War II, By 1955, there were around 300 non-commissioned pilots in the Navy, and of course that number continued to fall as the years went by. 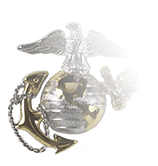 On January 31, 1981, the Navy’s last enlisted pilot retired. 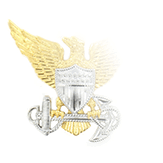 For the next 25 years, only officers could earn the right to wear the Naval Aviator badge. But in 2006, the Navy announced the creation of its Flying Chief Warrant Officer program, which reintroduced the opportunity for enlisted Seamen the chance to become Aviators of Naval Flight Officers. 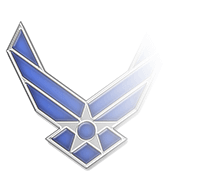 But during the program’s eight-year existence, very few Warrant Officers were selected for training as Aviators—just ten for each of the first two years. By 2012, the last year a selection board was held, only three Seamen were chosen for training as pilots.